Hurricane preparedness | Florida Hikes! Backpacking skills are survival skills. Use your knowledge and gear to make personal preparations for hurricane season power loss and evacuations in Florida. Back in 2004, when my home near the Cross Florida Greenway took a direct hit from Hurricane Jeanne, one of the four hurricanes of that crazy hurricane season, the power was out for nearly two weeks. Although I’d been through the remnants of hurricanes in the past, this was the first to affect me personally and directly as a homeowner. Thankfully I had family nearby to help with boarding up windows. Unlike my neighbors, my house was sheltered by a grove of ancient sand live oaks. After the storm passed, I had an acre’s worth of tree limbs to pick up, including off the roof. But my neighbors all lost part of their roofs. They’d cut almost all their trees down, as you see so often in suburbia. I had filled water jugs, bathtubs, and a broken hot tub with water, and I had that to draw from to flush toilets and have drinking water while the power remained off. My backup plan was to walk to a nearby pond and filter water if I needed to. With no power in the house, I reverted to “hiker midnight” by falling asleep and waking up with natural light cycles. I ended up sleeping on a sleeping pad on the back porch because it was cooler than the house. I used my headlamp to find my way around in the dark. 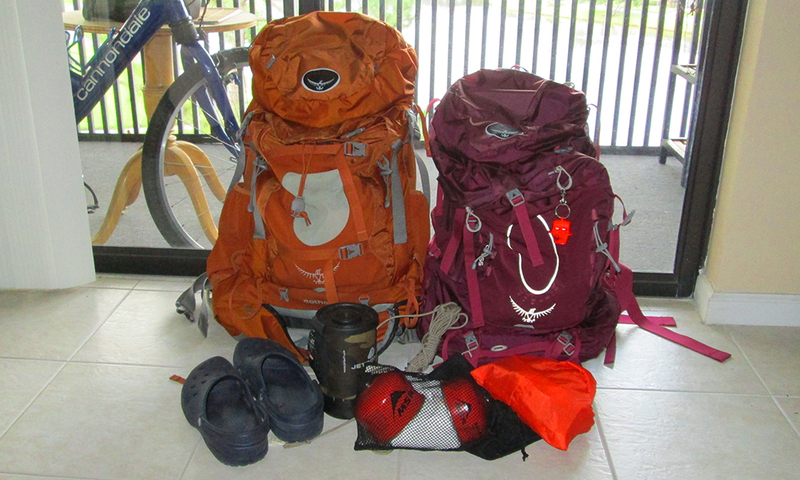 What I quickly realized is that my array of backpacking and camping gear worked just as well for a natural disaster as it did for spending an extended period in the woods with no electricity or potable water. If you don’t have this gear on hand, I suggest you visit your nearest local outfitter (and yes, even the camping section at Walmart) to stock up on essentials to get you through the lack of municipal services that inevitably follows after a direct hit of a hurricane. 1. 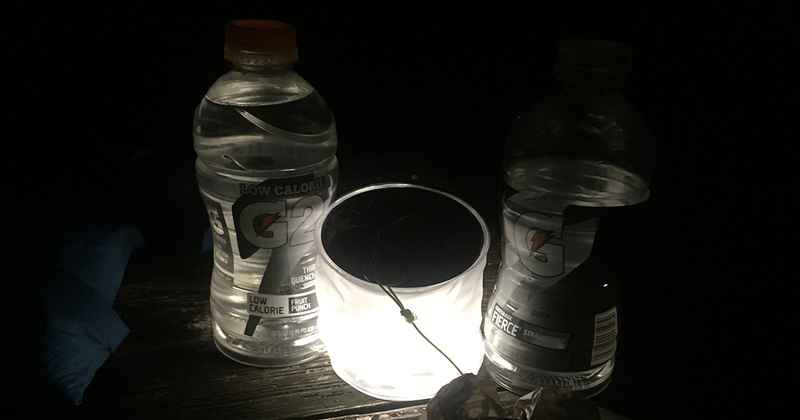 Headlamps, lanterns, and solar lamps. Headlamps are less awkward to use to rummage around the house when you’re out of power than it is to hold a flashlight, since headlamps are hands-free. Lanterns are fine for sitting on a counter or table. Get spare batteries for both. This is also the time to invest in a solar-powered lamp (like Luci Light) if you don’t already have one and can find one. Be sure to set it in a sunny spot to charge it up while the sun is out. 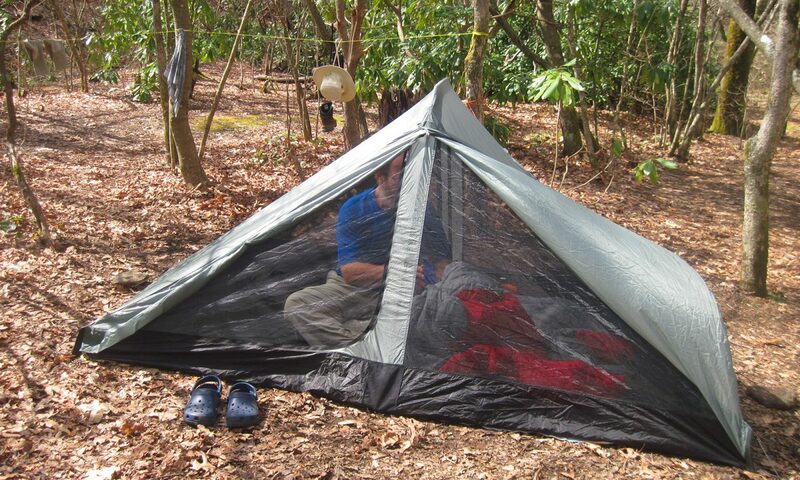 It provides hours of modest illumination for a room because it’s downright bright in the interior of a tent. 2. 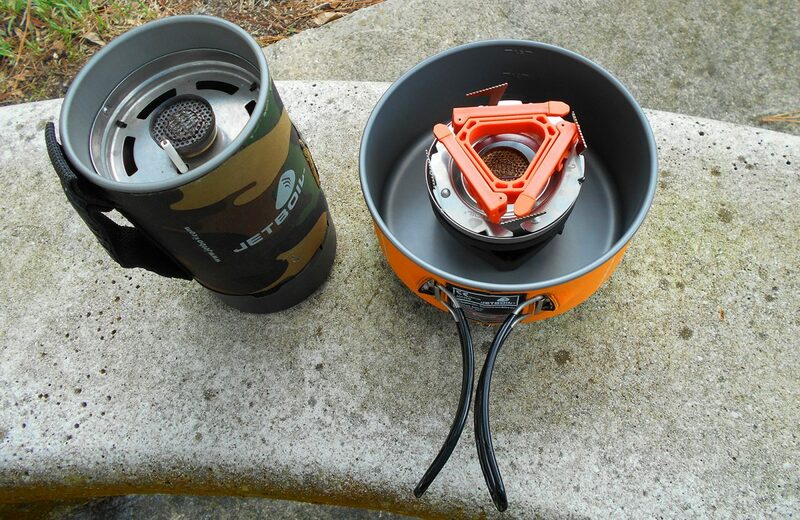 Hiker kitchen: backpacking or camp stove and fuel and pot. You’ll thank yourself for having these on hand so you can eat what you have in the pantry. You can fire up a Jetboil (which has the pot built in) to cook beans and rice, pasta with sauce, and anything else you’d cook in a pot on a stovetop. A larger stove for car camping, like a one or two burner Coleman, will let you cook meats in a frying pan. Of course, if you own a gas grill, that’s the ultimate in being able to manage your meals without power. Just make sure you have enough propane on hand for a week or so. 3. Drybags. I see a lot of suggestions online for putting your important papers in a plastic box to take with you if evacuating, or store away from floodwaters or rain. A quality drybag won’t keep them in a nice neat pile, but it’s far less likely to bust open and spill out if you have it cinched down properly. Another great property of good drybags is insulation. We discovered this by pouring a 10 lb bag of ice into an Outdoor Products backpack/drybag and putting our drinks in it while paddling, biking, and hiking in the Keys one summer. It can serve as a portable cooler for items that need to be kept cold. 4. Backpacking water filter. It’s one of those things that you hope you never have to use at home – since you should already have every water bottle and jug you own filled and ready for use – but it doesn’t hurt to have one because it gives you the option of hauling home water from a nearby lake, pond, or swamp and purifying it for use. 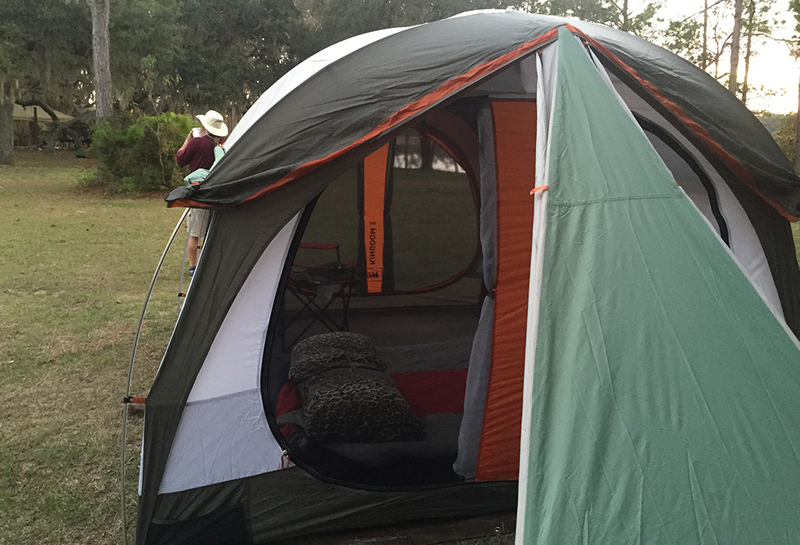 The Sawyer Squeeze is one of the simplest and lightest on the market and is made here in Florida. The Sawyer Mini is great for individuals. If you need to filter water for a crowd, the Katadyn Hiker Pro or Vario are good choices that can handle more volume. 5. Battery or solar-powered fan. It’s summer. It’s going to be miserably hot inside if the power goes out. Have a small camping fan to keep yourself cool. Stock up on the appropriate batteries if yours is battery powered. 6. Jump starter with USB ports. We found this for camping in our VW van, since many of the places we’ve gone with it have been campgrounds with no power hookups. And we had the very real concern of jump-starting the battery of a 1982 van in remote places, too! Since the jump starter is a large portable battery, it has to be charged in advance by plugging into a standard power outlet, but we’ve found that a small LED USB light and a charger for a smartphone can be plugged in for days on a single charge. Shut it off when not charging to save battery. Ours has a power level indicator on it so we can see how much battery is left. We always carry it when car camping and have used it in the tent as well. Available at auto parts stores. 7. Backpacker foods. Freeze-dried meals like Mountain House are easy to prepare since they only need water. 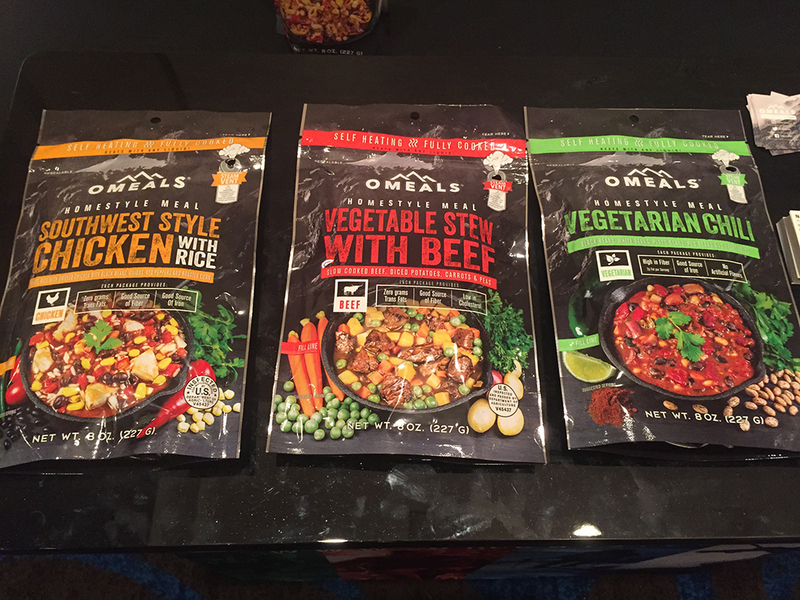 Last week at the Florida Outdoor Writers Conference, we learned about Omeals, a modern twist on a MRE but much tastier. The package includes a fuel source, so all you do is add water to the package and it cooks in the bag. The company is based in Florida, too. OMeals come in a variety of flavors and types. These are the quick and easy options. However, our long distance hiking experience taught us that you do not have to get fancy with food that will last in your backpacker for a week or more. Forage through your favorite grocery store for meats that require no refrigeration (pepperoni, salamis, pre-cooked bacon, tuna and other fish in cans), olives, peanut butter, nuts, cheeses with a rind or wrap (Babybels are a favorite for backpacking), and avocados, all of which provide protein and fat. For cooking on a backpacking stove like our Jetboil, our go-to carbs were packages of potato flakes, quick rice, and angel hair pasta – all of which cook in 5 minutes or less. Use olive oil in your cooking. Supplement with whatever else you like that doesn’t spoil quickly. After all, you don’t have to carry these on your back. 8. First aid kit. While there are plenty of over-the-counter first aid kits you can buy, we found it was best to put together our own based on our own personal medical needs. Include items like bandages and wraps, a small knife for cutting wraps, tweezers and nail clippers, asprin and ibruprofen, your favorite over-the-counter meds for stomach/intestinal/allergy issues, and all your prescriptions and vitamins. If you’re diabetic, glucose meter and tablets are a must. Have soap so you can wash your hands with soap and water. Keep this all in one handy location instead of spread around the house. 9. Duct tape and contractor’s garbage bags. We’ve used duct tape for repairs to backpacks and tents, and the heavy-duty contractor’s garbage bags – much sturdier than any other bags – as inner linings in our backpacks to keep the contents dry. The combination of the two gives you versatile tools for repairs. 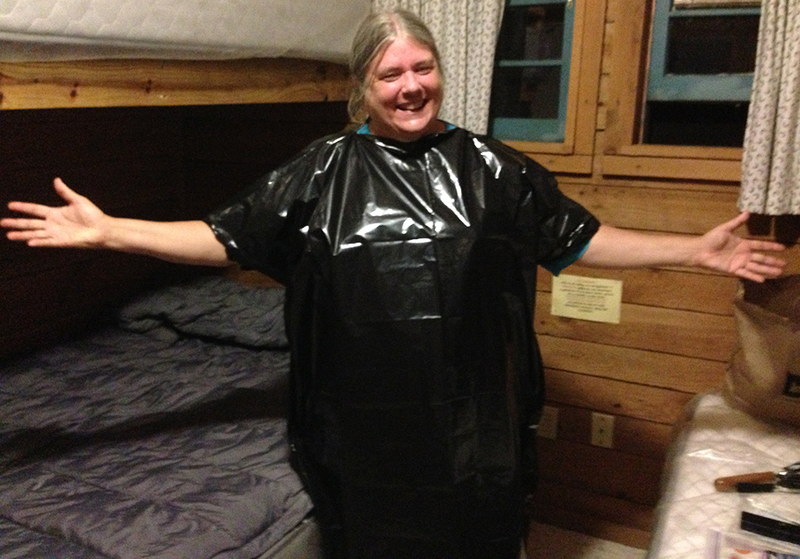 You can also make a rain poncho using these heavy bags. If water starts seeping in, you can put things in them that you don’t want to get wet. It’s essential that you fill all prescriptions you need days before any potential landfall of a hurricane. Make sure you have enough cash in hand for a week or two of personal expenses (gas, food, lodging) in case ATM machines fail due to power outages. And fill your car’s gas tank several days ahead of any projected emergency, too. If the power goes out, so does the ability to pump gas. If you have spare gasoline cans, it’s a good time to fill those up as well. 1. Pack your car like you’re going camping. If you have to evacuate, you have no idea where you’re going to end up. A campground well away from the storm’s path might be the easiest and cheapest option this time of year. In fact, Texas State Parks opened all of their campgrounds, for free, to evacuees from Hurricane Harvey. Bring the car camping tent, air mattresses (sleeping pads like Thermarest can be blown up without battery assist vs. the big car camping mattresses), blankets or sleeping bags and pillows, towels, camp chairs, cooler. Have a solar shower? Bring it! Don’t forget shampoo and soap, sunscreen, and bug spray. Home sweet shelter. If you have camping gear and can evacuate to a dry place to camp, do it. 2. Dress like you’re backpacking. Dig out those clothes than can be worn day after day after day. You don’t know when you’ll be able to do laundry next. Quick-dry nylon pants and shorts, underwear that can be washed in a sink and dries overnight. A lightweight bear bag rope doubles as a clothesline. Bring rain gear. 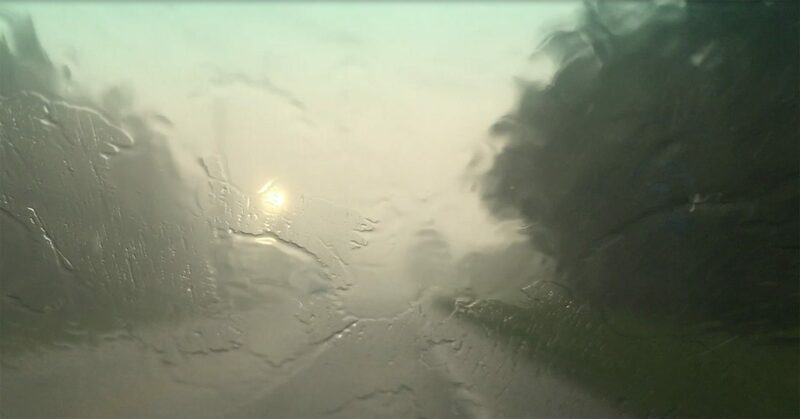 Umbrellas are useless in the wind, but a rain jacket and rain pants may help for when you absolutely have to step out in a torrential downpour. 3. Take along what you’d use at home if you expected the power to go out. That’s the list of items above plus jugs of water. If you bring canned goods (like tuna), make sure you have a manual can opener to open them. You’ll also want the other backpacker kitchen essentials – a Swiss Army knife and sporks (or bring similar utensils from home) – as well as soap to wash out your pot and to wash your hands. Having washable non-breakable dishes to eat off of is prudent. 4. Bring personal essentials. Your eyeglasses, prescriptions, important papers – including checkbooks, credit cards, safe deposit keys, car titles, and anything else you wouldn’t want someone to pick up off the street if your home blew apart. As we learned from watching the floodwaters rise in Houston, you may want to take a few small items of sentimental value with you in case you do otherwise lose everything. 5. Plan for pets. If you have them, make sure you have enough food and water for them and since they’ll be coming with you, whatever papers prove they’ve had their shots. 6. Give yourself something to do. You are not going to be spending hours on your smartphone if there’s no power. So bring a book or two you’ve wanted to read, a sketchpad or a notebook, or games to play with the family. Now is the time to prepare. Waiting until the day before a hurricane landfall means dealing with chaos at stores, empty shelves, and lines at gas stations. Use your backpacking smarts and pull together that hunker down or exit strategy with your family right away. LOOKING FOR GEAR? Start here. All reviews (alphabetically). Backpacking . Biking. Camping. Clothing. Electronics. Hiking. Paddling. Trail food. Travel. Essentials. Camp stoves. Headlamps, flashlights & lanterns. Hiking boots and other footwear. Hydration. Insect repellent. Knives and multi-tools. Packs. Sleeping bags. Sun protection. Water filters.